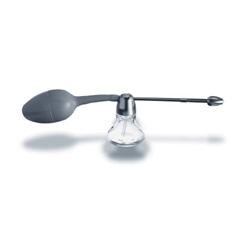 Metal atomizer with adjustable tip for directing spray up or down to reach inaccessible areas of the throat. Comes with 1 oz. glass bottle, metal top with plastisol bulb, adjustable swivel tip, and vented nasal guard. For use with oil or water solutions. Manufactured by Drive Medical. Comes as singles.